Welcome | Roots Landscape, Inc. This Main Line home went through a major home renovation project. The client turned the original tract home into this classic symmetrical home with all the necessary amentities one would want. 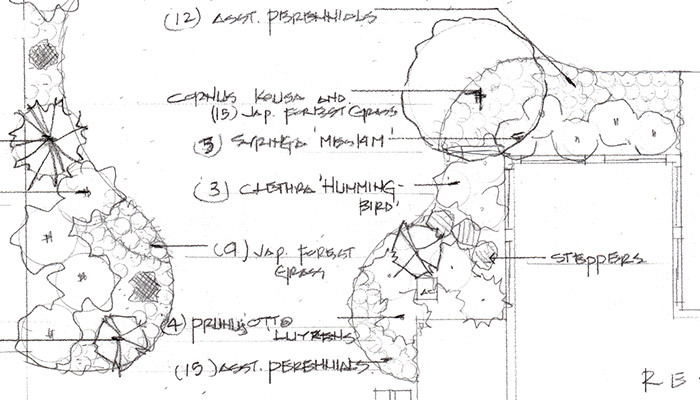 Seeing the the formal home, the client loved the idea of informal garden next to a very formal home. Roots added swaths of color, texture, and interest for all seasons. Using alot of natives, grasses, and colorful perennials, our landscape designer laid out ever perennial, shrub and tree. The interior courtyard flanks the main entrance and calms the eye as you walk through the garden. Taking a 200 year old farmhouse and transforming it into a modern space is no easy tasks. Our client was bold enough to put a large addition on this home that matched perfectly to the original home. Once construction on the home was completed, it was time for Roots to imagine a new courtyard for this already stunning space. We add oversized walls to match the farm buildings, pool, large sweeping steps, a courtyard using decomposed granite and large irregular flagstone as walkways. The oversized walkway was our favorite piece once everything was completed. Our team of fine gardeners are experts in bringing life to any space through containers plantings. From small courtyards to large planters, our horticulturist add beauty through mixing of textures, colors, and plant types. Our team of experienced designers & sales personnel make each client our top priority! We don’t so much as touch a shrub until you approve and love the design. Relax and watch your landscape take shape before your eyes. 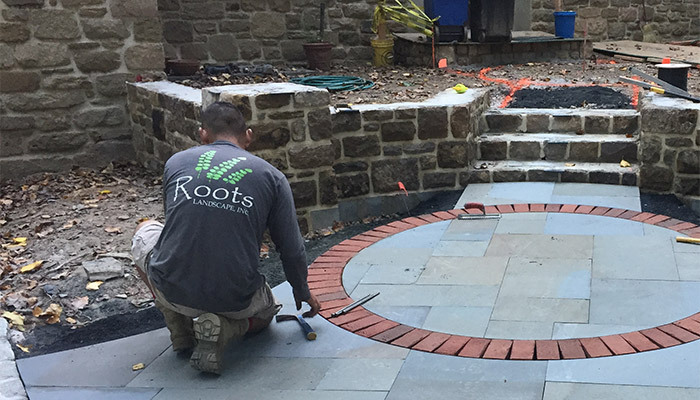 Roots Landscape Inc. is your premier Greater Philadelphia landscape design/build firm. Whether you are looking to update your landscape, install a new patio, or create a backyard oasis, Roots Landscape is your solution. Our qualified landscape architects, fine gardeners, and custom masons have over twenty years of experience building everything from pools and roof structures, to outdoor kitchens and fireplaces. Let Roots Landscape create the outdoor living space you’ve dreamed of. 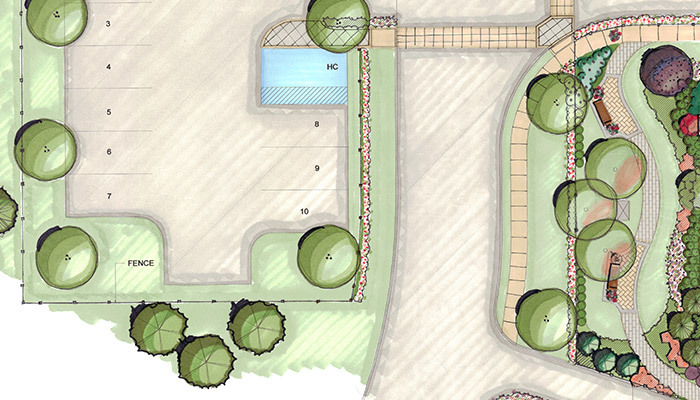 Our landscape architects, designers and fine gardening team do more than plant shrubs and arrange trees. They create a breathtaking mini ecosystem that embodies your personal aesthetic while incorporating the indigenous flora and fauna of your area. Don’t trust your dream project to just any firm. We use a stringent, client-centric process to ensure collaboration occurs at every critical junction and that you’re informed every step of the way. Roots Works On *New* Terrain Gardens! Roots has been selected to install the new Terrain Gardens at the Old Waterloo Gardens in Devon continuing the great relationship we have with URBN and Terrain! Stay tuned for more updates! We love clients reference us...in PHILLY MAGAZINE! Welcome to the brand new website for Roots Landscape, Inc. Please take some time to check out our previous work or see our upcoming events.